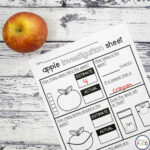 This crazy easy fine motor activity for toddlers is a great way to help their little hands get ready for writing later. With a new month approaching in preschool, I began jotting down some notes for the lesson plans for my toddler class. 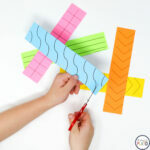 This activity was inspired by my 2-3’s class and designed specifically for their toddler hands. 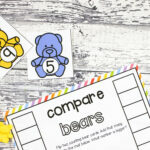 This easy peasy fine motor activity for toddlers was so well received! I have a feeling it will stay in our center rotation for a while. All I needed were two materials: An empty, clean spice or seasoning shaker, and some unused lollipop sticks. I dyed mine using food coloring, but plain white is ok too. 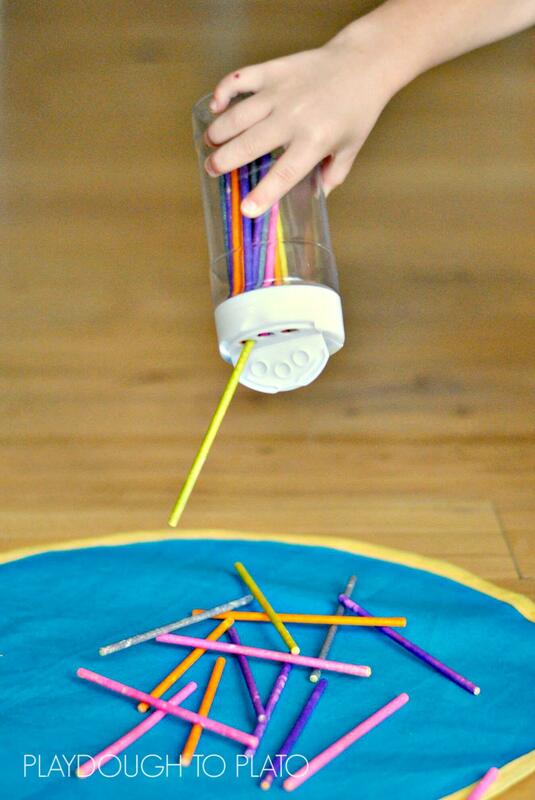 If you don’t want to use the lollipop sticks, you can also try those little coffee straws or Q-tips. I invited my 26 month old, Kent, to join me for a fine motor activity. I set out a preschool circle time mat to define the work space, but a tray would also work. 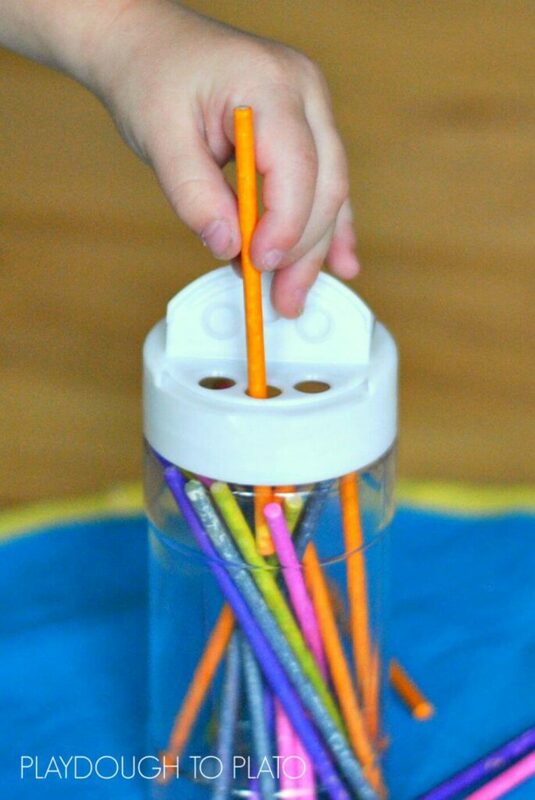 I modeled how to place the lollipop sticks into the spice shaker using the small holes in the lid. Because this activity is designed specifically for toddlers, I used the largest spice shaker I had on hand so that the holes would be bigger. Having bigger holes meant that the activity was still challenging, but not so challenging that Kent got frustrated. Kent worked and worked on this fine motor activity. Every few lollipop sticks Kent would try to grab a handful and put them all in at the same time, which didn’t work as well. I didn’t correct him, though. Not only was he learning through trial and error, but using different methods to put the sticks into the spice shaker called for different hand grasps. Every attempt, no matter the grasp, worked and strengthened his fine motor muscles. Kent’s favorite part of this fine motor activity wasn’t actually putting the lollipop sticks into the spice shaker, it was shaking the sticks back out! He’d say, “Done, Ma!” and then sit to put all the sticks back in. He completed three cycles of this activity, and had a bit of a melt down the next morning when I asked that he eat his oatmeal rather than play at his new fine motor activity. That day we put it out for the toddler preschool class. Every child gave it a try during free choice centers and enjoyed it! One of my favorite aspects of this fine motor activity form a parenting perspective is that the whole activity is small and compact. It’s small enough to fit in a purse and take out while waiting for your order at a restaurant, or waiting at a doctor’s office, or perfect for a busy bag for church. 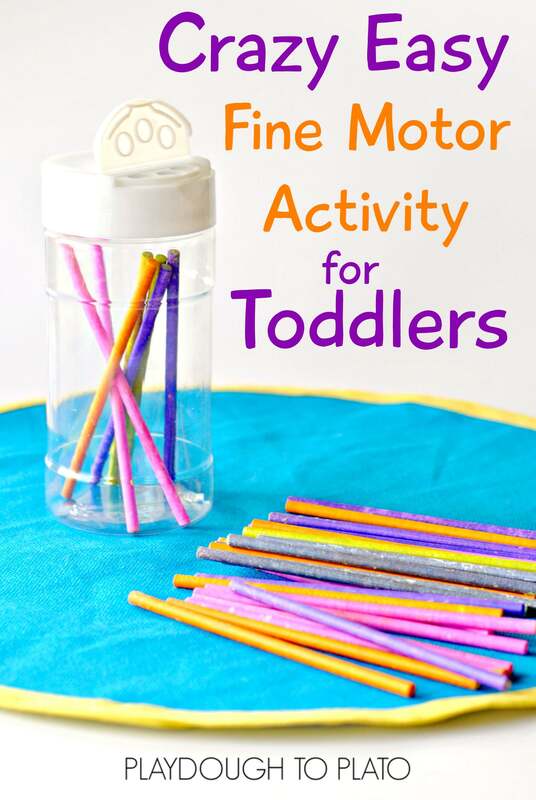 Finally, this fine motor activity for toddlers works their little hands in a variety of ways, encouraging the use of all the different sets of fine motor muscles in the hand and wrist. 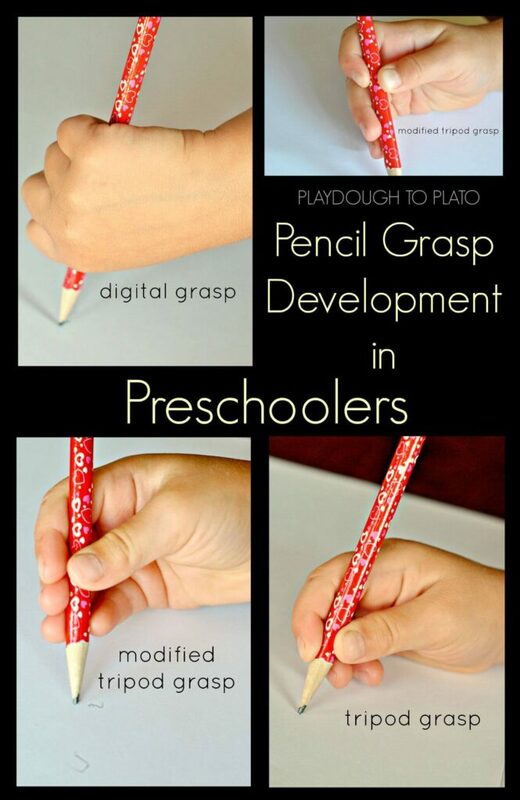 Wondering how to teach kids pencil grasp? 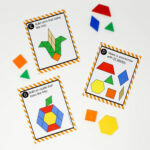 Check out our three part series for toddlers, preschoolers and kindergarteners!